There are some teams that are just more fun to watch than others. I believe this statement to be true for every sport in any league on the planet. Now, each individual fan may have different characteristics that that they look for in a team when deciding how fun the team is to watch, but in general, we can come to a consensus on which teams we love to see in action. Arsenal and Liverpool are more fun to watch than Chelsea and Manchester United. The Golden State Warriors and Houston Rockets are more fun to watch than the Miami Heat and Indiana Pacers. These distinctions may be somewhat arbitrary and biased, but the theme running from the Premier League to the NBA has to do with how teams handle offense, how they attack their opponents, and what kinds of players make the decisions for the team on the offensive end. In this year’s World Cup, the teams that are the most fun to watch, in my humble opinion, are those that turn solid defense into a ruthless all-out counter-attack, jumping on opponents’ necks when they are stretched out and enticingly vulnerable. Colombia, Chile, Costa Rica, Ghana, and occasionally Mexico and the U.S.–all relative minnows–have been the best teams at the counterattack, and all have used the strategy to get incredible results, many of them unprecedented. Costa Rica’s dismantling of Uruguay and Italy, Ghana’s and Mexico’s ties with powerhouses Germany and Brazil, and Chile’s annihilation of defending Champions, now first-round losers, Spain, were all immaculate displays. These teams haven’t parked the bus–which is a more Italian strategy. Instead, they park the other teams’ bus, hijack it, and speed with it all the way down to the 20…the 10…the 5…oh wait, wrong football, and wrong “Bus“, but you get the idea—they drive all the way to score goals and win dramatic, unprecedented, euphoric victories. Costa Rica’s Bryan Ruiz using his head to score the only goal in a win over Italy. And then you have the people in Santiago, Chile, Medellin, Colombia, and Mexico City, Mexico—to name a few—going absolutely nuts in ways that American sports fans might not be able to comprehend. I skipped school for the 2008 Phillies World Series parade, but these people drop everything, work and school, for every single World Cup game their team plays. At least soccer matches are only two hours long. The people care so much, and their teams have finally found a style of play that fits with the peoples’ longing, with their passion, their will to throw counter punches against the powerful, ex-colonizer European countries who have won a lot of World Cups between them. The teams are using their classic Intro to Economics comparative advantage against the big teams to whip ‘em. A neoclassical theory of comparative advantage states that less developed countries should grow their economies around industries that they have an advantage in, and they have an advantage in cheap labor, so they should focus on all kinds of agriculture and manufacturing. The theory often fails because of diminishing terms of trade, a key aspect of economic historian Alexander Gerschenkron’s Dependency Theory which argues: The goods that poorer countries produce are often the raw materials that rich countries use to make much more expensive finished products which they then sell back to the poorer countries. The big question here is: Does the counter-attacking style of football have diminishing terms of trade? Will it peter out in a dramatic fizzle, leaving the giants to duke it out in the quarter finals and semis of this year’s World Cup? 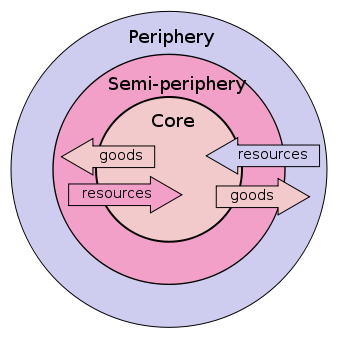 Dependency Theory: The periphery and semi-periphery countries get screwed. None of the teams playing the sexiest, most intriguing football are favorites to win the tournament right now. The power players remain Brazil, Germany, the Netherlands, now France, and probably whichever team makes it out of Group D between Italy and Uruguay. Each of these teams has shown utter brilliance and dominance in at least one game at this World Cup, but they have won in arguably less interesting and less stylistically thrilling fashion than the next tier of teams. The counterattacking teams of the next tier are more or less “out-Braziling” Brazil at home, as the Seleção have had trouble playing the beautiful football for which they are famous. Each of the counterpunching minnow teams goes hard for the full 90-minutes, knowing that they can’t let an opportunity to drive ahead pass by, because it’s that one goal that will at least get you a tie if your defense is on form and that second goal puts a team away, even Spain, even Uruguay. Spain, already out of the tournament, had 56% and 57% of possession in their first two games, and yet they were completely outplayed and outclassed when it came to offensive lethality and lost both matches by a combined (and shocking) 7-1. Their second loss came to Chile who have relied heavily on star Barcelona midfielder Alexis Sánchez, one of the most exciting players in the tournament so far. Sánchez is helped by a talented group of players around him including the dynamic Artuoro Vidal, Eduardo Vargas, and Charles Aránguiz, who played out of his mind against Spain, and scored off of a rebound of a Sánchez free kick. No team in the tournament wants to play Chile right now. That can also be said of Colombia. Colombia’s young star James Rodriguez celebrates his goal against the Ivory Coast. The talk of the tournament is Colombian 22-year old star striker Alex Rodriguez, who scored on a beautiful and difficult header against the Ivory Coast. He’s helped in the attack by Teófilo Gutiérrez who has a goal and assist in the first two games and super sub 21-year old Juan Quintero who scored against the Ivory Coast after not playing against Greece and should get more time in future matches. In both of their first two matches, Colombia had less possession than their oponents–46% against Greece and 44% against the Ivory Coast–but Los Cafeteros dominated both games. And then there’s the surprisingly undefeated Costa Rica, who took out perennial giants Uruguay and Italy in their first two matches with only 46% and 42% of possession in those two wins. “Pura Vida” is a popular phrase in the Central American nation, meaning literally “pure life” but more commonly “plenty of life” and is used in different ways, as a greeting and farewell and as a way of saying “I’m doing well.” The Costa Rican football team has certainly embodied Pura Vida at the 2014 World Cup in both the purity and vivacity of their play. The most striking facet of their match against Italy was the way that Los Ticos seemed to be playing for one another, making runs to find openings, getting into open space when one of their teammates was in trouble, and generally being in the right place at the right time with good movement. Italy, on the other hand, played only as a collection of talented individuals and seemed to be just waiting for a moment of brilliance from forward Mario Balotelli. That moment never came. Each of the minnows is led by a core of veterans such as Mexico’s 35-year old leader Rafa Marqurez, who is remarkably playing in his 4th World Cup and Colombia’s rock-solid 38-year old center back Mario Yepes. Around these battle-tested warriors, the young, fast, highly skilled attacking players are told to run, run, run, and never stop. They prove that it’s not about having the ball but about what you do with it that matters. It is likely that at least one of the giants makes it to the final, but it is also likely that one of the little guys makes it too. My friend Tamir recently texted me: “I’m for Mexico, Columbia, Chile—It’s all about the young kids who are always smiling playing non-stop attacking, countering football—they never park the bus. it’s 24/7. you have to root for them.” And I have to agree with him at the moment. It looks to me like one of these counterattacking, younger, “smiling” squads might just go all the way.